Whatâ€™s up with this crisis in Ethiopia? Well, the government has recently declared a state of emergency and are going full authoritarian-dictator on their citizens for the anti-government protests that started November last year. Itâ€™s pretty lit – but not in a good way. Since the start of the protests, the death toll is said to be over 500, and the military is on a national crackdown – soldiers have even been pulled out from Somalia and are deployed in high-tension areas. watching foreign-based television stations, Ethiopia Satellite Television and Oromia Media Network – which are being referred to as â€œterroristâ€ media by the state. It started when the current regime started seizing land from the ancestral home of the Oromo people for a â€œdevelopmentâ€ project to expand Ethiopiaâ€™s capital city, Addis Ababa – ominously referred to as â€œthe master planâ€. After over 100 people died protesting this land grabbing, things snowballed into a nationwide anti-government uprising based on a number of issues relating to ethnic tensions, social inequality, the stateâ€™s repression and lasting political grudges for historic injustices. â€œHistorically what we call Ethiopia was called Abyssinia. The Abyssinian highland and the Abyssinian people, ancestors to the Amhara and Tigrayan people, dominated other oppressed peoples. So actually I would say they have occupied this land – the land of the Oromos have been occupied by the Abyssinians,â€ said Omar. Ethiopia has a long history of being ruled by minorities. Until 1991, it was the Amhara people in power under the rule of the Communist Derg government, led by Mengistu Haile Mariam. Since his overthrow, led by the Tigrayan Peopleâ€™s Liberation Front, Ethiopia has been ruled by the coalition party, Ethiopian Peopleâ€™s Revolutionary Democratic Front (EPRDF). 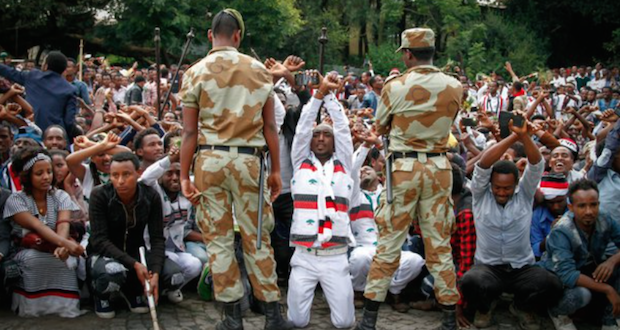 This is the ruling party which the current protests are targeting – partly because the EPRDF is made up predominantly by Tigrayan people, but mostly because the regime is considered entirely oppressive. So thereâ€™s a long history of Ethiopian ethnic tension, as well as struggle against minority rule. â€œSo regardless of the master plan, even in the Amhara region they are fighting. Not only the Oromos, who people are saying to mislead the international community that they are uprising because of the masterplan, the master plan is only the most recent of the oppression which is centuries-old,â€ said Moalin. Itâ€™s not clear at this point, since there is no strict sense of unity across the various regions that are uprising. â€œThe Amharas, they are fighting for democracy, whereas we are fighting for self-determination of the Ogaden region. Unless these rights have been obtained, the uprising which has paralysed the economy, and which has paralysed the unity of the Ethiopian people, [will continue]. The Ethiopian people are not united, the Oromo are fighting on their own, as are other regions,â€ said Omar. Whatâ€™s the way forward for the Ethiopian people then? Is there a need for international intervention? Well, hopefully it doesn’t come to that. Despite the regionâ€™s disunity across historically drawn ethnic and regional lines, the current government has provided a common enemy for the people of Ethiopia. â€œYet there is hope for we do have one common aim, an enemy to overthrow and get rid of this despotic regime and its tyranny. We have now been forced to understand each other. We are now aware of each other and have created the Peopleâ€™s Alliance for Freedom and Democracy (PFD). This is an alliance that incorporates most of the groupings and created an umbrella organisation to reinforce each other economically politically – even media wise we have to collaborate,â€ said Omar. Self determination is not the solution if you really want the prosperity and well being of your nation. Come together and form the united Ethiopia where the rule of law raigns. You should take a lesson from Eritrea unless you want to be another African dictator who enjoys life at the expense of his own people.